It's Tuesday, my kids have been out of school for a big 4 days! We had a busy weekend, like most on Father's Day weekend. I co-threw a baby shower for my brother and SIL on Saturday and it was a beautiful day! We had a whole day of family time, which in our lives is rare! I enjoyed it, my kids enjoyed it and of course my brother and SIL loved it! Sunday everyone spent the day loving, spoiling and having fun with their dads. We of course had a little different day. May awesome, hard working husband had duty. We spend part of the day with my dad and extended family and then like every other Father's Day in the past couple of years, we headed down to the firehouse and spent some time with hubby. 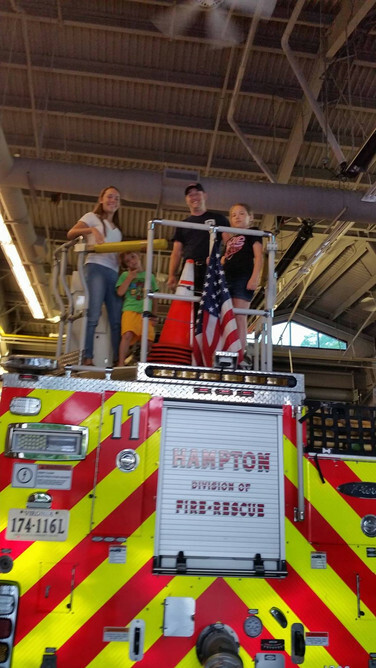 The kid's love the firehouse, the "ride" the engine, check the bunks, run through the bay, write on the whiteboards in the meeting room, get ice from the ice machine and of course talk to all the other firefighters at the station. Our holidays, like Father's Day, isn't about cookouts, amusement parks or binge watching tv, but we make the best we can! Being a mompreneur and trying to have a successful business while trying to have happy kids can be hard! Summer is the time for fun! Not coped up in the house helping mom, or waiting for mom to finish orders to have fun. It's a hard ballance! And when your husband is a hard working firefighter who works a second job on days off, mom guilt gets you even more. Yesterday we spend the day deep cleaning, I mean deep cleaning my 2 youngest bedrooms. Pulled everything out, reorganized, got rid of a ton! and even rearranged my daughter's room to give her more room. It was refreshing to get this done on our first day of summer. It's not looming over my head all summer long, but also gives the kids a daily chore before we leave the house everyday, is your room clean? Today I got up early, before all the kids, and started in the sewing studio. I worked all day! I send the kids outside to play and I worked. I worked on orders, new designs, the etsy page, marketing. I worked all day. I'm not done for the week, I still have a few open orders, but I got a lot done. I am satisfied with my progress that I promised the kids I would take them to local water park all day tomorrow while my husband is at the firehouse. I feel like summer is a success so far. 4 days in and I've already checked a few things off my list. I'm going to continue to work hard during this week because this weekend is a rare weekend for us! Hubby is off both Saturday and Sunday! I whole weekend, 2 days! This is rare, in fact so rare it's the only one until August for us!! I'll keep you posted on the fun we decide to have! But remember you can always keep up to date with me on both Facebook and Instagram! !